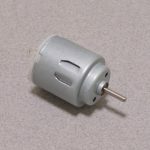 This high powered gear motor is a 12V DC motor attached to a strong metal gearbox. The gearbox reduces the motor output shaft speed to approximately 92 RPM, and in turn makes it quite strong. 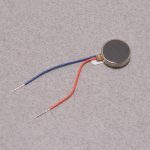 The motor and gearbox measure 25mm in diameter and 56.6mm long excluding the output shaft, which extends a further 11.75mm. The 5mm diameter output shaft has two flatted sides, making this a breeze to use with 5mm shaft couplers. Two M3 mounting holes are tapped into the gearbox housing on the motor face for mounting. A simple wire harness with inline connector is also pre-soldered to the motor. SKU: ROB-107. Category: DC Motors. Tag: DC Motor.